This article is guest posted by John Rodica. 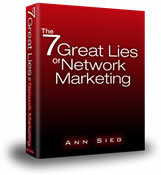 When Ann Sieg released a free report called, “The 7 Seven Great Lies of Network Marketing“, it created a varying array of responses from those inside the mlm industry. Both praises and criticisms came from all corners, making this short 35 page e-book even more controversial. Inevitably, the buzz caught on to its worldwide audience, which is why people are still talking about it until now. It was direct to the point, truly reaching the heart of those frustrated with their business. The 97% failure rate in the network marketing industry just shows that those struggling simply gave up before they even attained their goal. Such crazy figures prompted Ann to expose the inefficient recruiting methods that many are so fed up with. It’s a fierced world out there, and being properly equipped with such knowledge early on offers a greater chance of success in this industry. Even those not in the mlm world would definitely appreciate this informative tool. Just a word of warning: if you actually enjoy attending countless meetings, and following up with people that are “praying” you won’t ever bring up your opportunity again, this report may not be for you. If you’re curious to peak into the other side of network marketing that your sponsor probably never told you about, Ann Sieg’s FREE e-book is going to be a treat. It gets my highest recommendation. Warning: Many top money earners, lead generation companies – and even some MLM corporations – are terrified of this information getting into the hands of too many people (it’s already been downloaded by well over 150,000 distributors) and have taken steps to have it banned–permanently. Grab your copy now before it’s too late! makes me me think that she is as full of bull as any of the marketers she is trying to trash. I really liked this report and how it kind of bashes all the ridiculous sales pages. If you’ve seen 1 you’ve seen them all, the only difference is the name at the top. some does work. alot more doesnt. to me i will only join if im goin to use the product myself. if i dun use them. no body else will. thus is a dying mlm. well if ur using the stuff like me u wont bother if any1 joinin u or not. either they join or not u will b using the stuff for ur own good. Thanks for posting this, man. The lessons here really do stand out from the rest of BS out there. Ann Sieg’s got it down! ::sigh:: I’m feeling a little drowsy now, just gone through a 20+ hour plane ride from Chicago to Philippines… Let us meet soon, allrighty? Agree, no such thing of everyone is ur prospect. It is just the common technique they use to make scam. Thanks For The Article! I use youtube and get 200-300 leads weekly free I love it!